A number of incidents at the end of last week's NASCAR Truck race led to a near brawl between the crews of Max Papis and Mike Skeen. 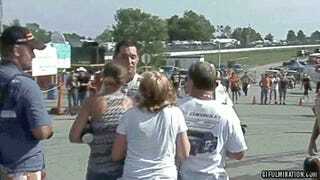 Skeen's girlfriend took things into her own hands, slapping Max Papis. Now NASCAR has shown its hand and banned Skeen's girlfriend from events indefinitely. Kelly Heaphy, who slapped Papis, has been given an indefinite ban from all NASCAR events and has also been fined $2,500 for her involvement in the altercation. It's one of the most ridiculous videos we've seen recently. What was more ridiculous was that Papis said he had a dislocated jaw from the slap, which means it has the strength of something between a single piece of spaghetti and damp paper towel. He has since backed away from that claim, but NASCAR officials still looked down on Heaphy's actions, since they just slapped (Get it? I think that's called a pun!) her with an indefinite ban. Ouch.